HKS Jewellery is a leading handmade jewellery studio based in London, UK. We have been making jewellery since 7 years. We are known for personalised jewellery which fits your budget and style. All our creations are bespoke and carefully handcrafted with love. We have an extensive collection of women's jewellery available online. There is a thought process and story behind every handmade jewellery piece. Personalised jewellery items are created with love and care. 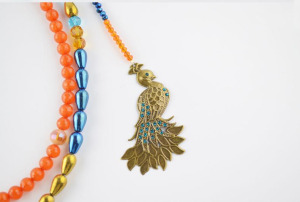 Our beaded jewellery collection offers mix of gemstones with different types of beads such as glass beads, rondelle beads, faceted beads and much more in the beaded jewelry. We use 925 silver for premium jewellery range. We offer worldwide free delivery on all our products.